Uddin was cited for unsafe operation of a vehicle, careless driving likely to endanger person or property, failure to wear seat belt, speeding, improper display or unclear plates, and numerous other violations. Municipal officials said Uddin, 29, applied to become a police officer last year. Police did not hire him after uncovering the more than 30 violations racked up between 2006 and 2018, according to a municipal source. Three different jurisdictions cited him for safety glass requirement, usually for driving with tinted windows, four times between Apr. 2015 and Jan. 2018. Uddin downplayed the violations when asked about it in mid-October. “I can show you the abstract,” he said. He did not provide any documents. Uddin did not respond to a call for comment on Wednesday. Furthermore, Uddin was charged with disorderly persons offense. When asked about this offense in mid-October, Uddin said he paid a fine to resolve the matter. Uddin “surreptitiously” followed a resident into an apartment complex at 30 Easton Avenue in New Brunswick on Feb. 20, 2012, according to court records obtained by the Paterson Times. He “piggybacked” to gain access to the interior of the building, says the court documents. He then went to the 9th floor lobby. It’s not clear what Uddin was doing at the location or why he was following a resident into the apartment building. Uddin paid a $500 fine after the charge was downgraded. Some of his opponents and allies in the 17-person school board race were surprised by the large number of moving violations and the disorderly persons offense. Uddin, Gonzalez, Gerard Robertson, and Melissa Baralt are running as a group. Five school board seats are up for grabs. Three are full and two are unexpired terms. Uddin is running for one of the unexpired seats. Former school board member Corey Teague said voters have to consider his past before casting a vote for him next week. “When you run for public office your life becomes public,” said Teague. Uddin tried to secure a school board seat earlier in the year when ex-school board member Christopher Irving vacated a seat. He did not make the cut after a rough interview. 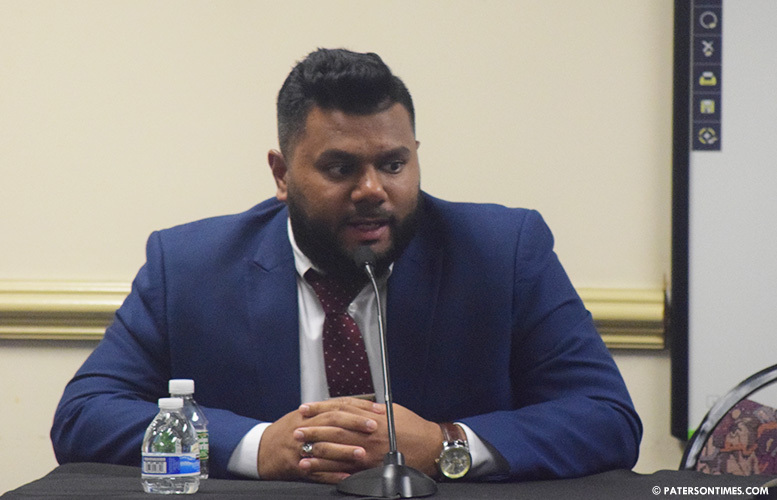 “NJQSAC is an organization that’s from the Board for the students and for education for a better opportunity for the Paterson students,” answered Uddin. Quality Single Accountability Continuum (QSAC) is a metric the state uses to evaluate public school districts. Davila endorsed Uddin and his running mates in the race. Uddin’s father is Taj Uddin, who unsuccessfully ran for a school board seat in 2014. The father did not attend any debates or forums when he ran. The father’s name came up several times during the 2nd Ward election fraud trial in 2016. One voter testified the father allegedly told her to vote for then-candidate Shahin Khalique and filled out her mail-in ballot. Another said the father and a second person pressured him to vote in the hotly contested 2nd Ward election against his will. No one in a position of power anywhere in Paterson is qualified for anything but menial labor. They are all a bunch of corrupt incompetent hacks, for proof look at the condition the city is in. I'm not concerned with the traffic violations, but how he did on the interview not knowing the answer to those questions, the night in brunswick that has little informations, has me wondering what kind of Role Model he would be. Based on those, he is in no way a fit for the community. But he will probably get a high number of votes just because of the influx of voter fraud I expect. Maybe he should hold a public forum so people can ask him questions on what he has planned if he gets elected. All ive seen from him is green screen scripted videos of him talking about the same thing. It sounds like lies. John Brown, YES I DID. While I am at it, there is no suitable candidate from the list of folks running for this position. I went to school with two of the candidates here and they are dumber than a sack of potatoes. I just believe you have have to actual know what the education system is all about. The education system failed Mosleh, failed Ramon, failed a good amount of them. My word of advice to everyone: Send your kid to private school. When your kid knows better math in the 4th grade in private school than either of those candidates do in their current age you'll appreciate it.